Pomegranates have been used in many cultures for medicinal purposes for thousands of years. Many claimed pomegranates is an effective protection against inflammation, heart disease, high blood pressure, cancers including prostate cancer and recently researchers at Ecole Polytechnique Fédérale de Lausanne found a compound in pomegranate that can slow down aging process. This fruit is packed with dietary fiber, antioxidants known as tannins, iron, and vitamins A, C, and E. The recent study is published in the Journal of Nature Medicine. This is not the first time in which pomegranates have been known for its anti-aging property, but in this study, the scientists found exactly what compound slows down the aging process. However, there is a catch. According to the scientists, before this compound can process its anti-aging action, the gut bacteria is needed to activate it. Hence, having a good gut health is vital in order to maximize this particular benefit from pomegranates. The name of the compound is urolithin A, which is metabolized from a naturally occurring compound in pomegranates called ellagitannins. Pomegranate is among the list of superfoods and touted as aphrodisiacs. However, there is no magic in this fruit. It is simply rich in various nutrients that our body needs for nourishment. Pomegranate extrac is also often used in male enhancement pills, and one of the popular dietary male pills that utilizes it is Male Extra. Moreover, as scientists in this recent research said, this anti-agig compound in pomegranate requires the gut bacteria to activate it. Hence, make it a habit to eat healthy especially whole foods and avoid highly processed foods including refined sugars and carbs. Get yourself a good dose of complex carbs from whole foods. No wonder the people living in regions where whole foods are priority looks younger than people who eat the Western-type diet. Since we’re talking about pomegranates, do you know that his fruit is also effective and helpful for people with Alzheimer’s disease? This cognitive decline is one of the most notable sign of aging. 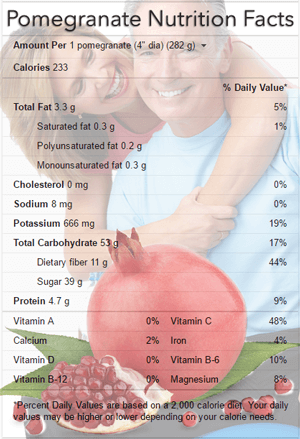 Note that, although pomegranates contained this anti-aging components, it’s only a part of the overall healthy lifestyle. For instance, having quality and regular sleep every night plays a vital role in aging and cognitive function. In fact, one study in 2013 found that lack of sleep can result to faster skin aging. Hence, make aiming to having a good quality sleep every night. As you can see, all the dots connect. Although we’re first talking about pomegranate anti-aging compound discovered recently and how it can be activated via the gut bacteria, we found another benefit of pomegranate, which is helpful for people with AZ and until we get into sleeping as part of an anti-aging solution. This proves that one is only a part of a whole array of things we do in healthy lifestyle practices. So, eat healthy, stay active and get enough sleep. Hope you enjoy this article and before you leave, here’s another good reason why you should get enough sleep according to Jeff Iliff of University of Rochester Medical Center. And, I’m convinced that the anti-aging benefit of pomegranate along with sleep is a potential cure and prevention of Alzheimer’s disease.